This article was written By John Berra on 24 Jan 2016, and is filed under Reviews. Those who go into Matt Szymanowski’s debut feature The Purple Onion simply knowing that it stars Chinese American comedian Edwin Li as a stand-up pursuing his dreams in the idyllic city of San Francisco may expect an amusing indie, peppered with riffs on the minority experience. Such viewers will soon feel a bit perturbed, though, as this is actually a dark comedy that favours acute observation over flip one-liners. There are occasional echoes of Todd Solondz’s corrosive character assassinations here – the illustrated poster artwork for The Purple Onion recalls the promotional design for Solondz’s vicious satire Happiness (1998) – although Szymanowski is not nearly as misanthropic in his take on selfish behavior. The prickly protagonist here is Johnny (Li), a dishwasher by day and stand-up comedian by night, refining his act on the club circuit in the hope of crafting the kind of material that will make him a performer with breakout potential. We meet him in the middle of a slump: a booker observes that he’s been recycling jokes for a while and his confidence issues are even preventing progression at his restaurant job where he is trying to move up to a better paid server position. 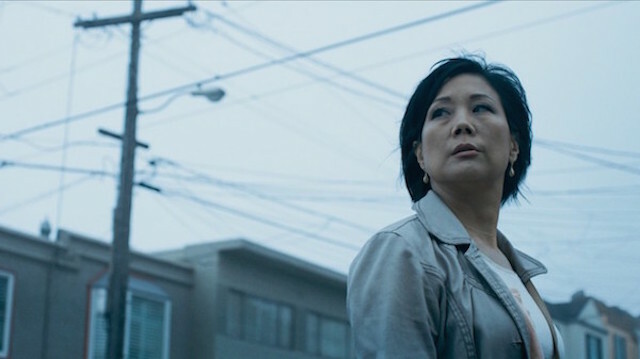 Johnny’s fragile mood is further tested by the arrival of Jeanie (Noreen Lee), an older family friend or perhaps relative who has just relocated to San Francisco to start over and needs a place to stay while she looks for a job. Although less than pleased to share his already cramped apartment with a person to whom he is tenuously connected, the fiercely private Johnny eventually turns to his roommate for a dose of much needed intimacy. It’s a relationship that develops in minimalist fashion with backstory left vague and Jeanie positioned as unlikely figure of mystery. As an up-and-coming performer, Li (who collaborated with Szymanowski on the story) takes a commendable risk playing a comedian whose monologues certainly yield a few laughs but are far from outright hilarious as Johnny struggles to find a steady groove by trying out material that ranges from risqué humor, to family history, to gags that play on Asian American stereotypes. One might expect stand-up to provide a brief respite from Johnny’s daily frustrations, but it only seems to exacerbate the comedian’s loneliness. Szymanowski and cinematographer Bartosz Nalazek frames his club appearances in sweaty tight shots or uses floating hand-held motion with the crowd’s faces blurred by the spotlight. With no cutaways to the audience, Johnny is disconnected from the scene that he so desperately wants to be accepted by. Flickers of pleasure (or relief) can be glimpsed on his face when a joke hits as anticipated, yet are soon to be replaced by his perpetually tense expression as he attempts to land another zinger. An early scene at a coffee shop finds Johnny seeking to entertain a toddler at the next table by pretending to pick his nose and pull his jacket over his head to mimic a monstrous hunchback. The child is delighted, but performer and junior spectator are kept apart, with Szymanowski cutting back-and-forth as a means of achieving distance. Johnny’s passive-aggressive relationship with Jeanie is defined by the same compositional boundaries. Jeanie strives for an easier dynamic with her reluctant host, but is constantly rebuffed by the abrasive Johnny, who prefers to find solace in habitual masturbation. Jeanie has questionable personality traits of her own – she gently manipulates others in her career counseling workshop, notably the clearly besotted Ken (Vint Carmona), and snoops around Johnny’s apartment to pick up some sense of his inner life – but is more resilient with less fear of the world, regardless of whatever setbacks she has recently suffered. Even though one is inclined to agree with the dismissive Johnny that the course she is taking is a scam based on its drab office space, standardised activities, and the perfunctory manner of its main advisor (Carla Clay), the quietly determined Jeanie looks set to emerge from the process with a legitimate chance of a fresh start. The film’s title refers to a cellar club located in the North Beach area of San Francisco, which was guaranteed its place in comedy history in 1961 when Lenny Bruce was arrested on-stage for using the word “cocksucker” during his act. In 2012, the venue was closed, creating a hopeless void that Johnny has been sucked into. Jeanie tries to straight-talk him out of it, but it’s hard for her mature perspective to reach a self-absorbed young man who drowns out the world by listening to his own routine through his ever-present headphones. Nicely underplayed throughout, The Purple Onion is an incisive seriocomedy which isn’t afraid to go to some unexpected places in its examination of the awkwardness that must be endured in order to come up with a great punchline. The Purple Onion is showing on February 21 at the Seattle Asian American Film Festival.